Michael Johnson has a new post up, about the books he read during 2015 that he most recommends. Here's the beginning of his review of Galileo's Middle Finger: Heretics, Activists and the Search for Justice in Science, by Alice Dreger (2015): "This might seem like a weird riff, but right off I'm going to assert readers of Robert Anton Wilson will probably love this book, which I think will prove to be influential in the sociology of science. Especially if those RAW readers liked his The New Inquisition: Irrational Rationalism and the Citadel of Science." 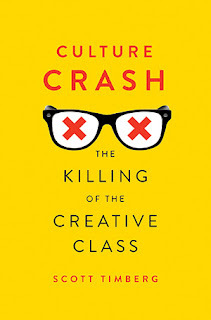 I do want to read that, but Michael makes me want to read Culture Crash: The Killing of the Creative Class, by Scott Timberg (2015) even more. It's about how the Internet has radically affected the lives of musicians (such as Michael), writers, record store clerks who could tell you what to listen to, etc. There are reviews of three other books, too, all of which sound interesting. Michael says he could have written about 15 to 20 other books. I can only hope he'll do a follow-up post. I have linked hundreds of books to Amazon and I wasn't never a part of the Affiliates Program, but one night when I tried to sign up I couldn't figure it out, so I wrote them asking for help and no one responded. The main reason I ambivalently linked to books I was talking about was Amazon does a good job providing extra info: a pic of the cover, maybe a chance to "look inside," and then there were other comments from readers. I didn't link this time. 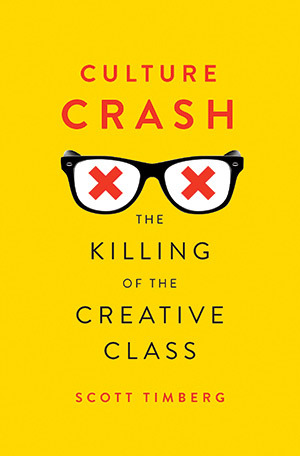 I might resume in the future, but after Culture Crash and reading a few interviews with Bezos, my ambivalence has increased. My plan is to blog much, much more in 2016. I'll write more about books, but my perennial problem is I'm too interested/enthusiastic about too many things; I have too many ideas to write about, and I understand this has been called a writer's Hamlet Syndrome. Too much thinking/can't take action in writing = no writing. In one of Paul Krassner's first "Impolite Interviews" for The Realist - another book I re-read in 2015 - in 1959, Alan Watts talks about Hamlet being non-zen and non-liberated, a classic case of "too much feedback." I saw myself there. So: a New Year's Resolution for me: Be less like Hamlet. I mean, I know a hawk from a handsaw, but I'd rather not have all those deaths on my own hands. And suicide just doesn't...call me weird...it doesn't appeal to me. What gets me enthused about life is something I take as a "fact" (and I forget who said this, so forgive me): "There are more things in heaven and earth than are dreamed of in your philosophy, blog readers." Harold Bloom sees Hamlet as the most intelligent character in all of literature. I don't know if I would want to become less like Hamlet in that respect. Yes, Hamlet contemplates suicide after the death of his father, but he has many other aspects as well. Orson Welles thought Hamlet lived into old age and became Falstaff. I want to become less like Falstaff in that I'd like to lose weight, but I would like to become as intelligent and funny as Falstaff. Eric- ever since I first read Hamlet around age 18 I admired him. But Alan Watts's take on "too much feedback" making him unable to act made sense to me. I bought a used copy of Bloom's _The Western Canon_ not long ago, largely due to your comments on it. And what a meaty work it is! Vico as formal device for Lit Crit. Anxiety of Influence and Shakespeare.